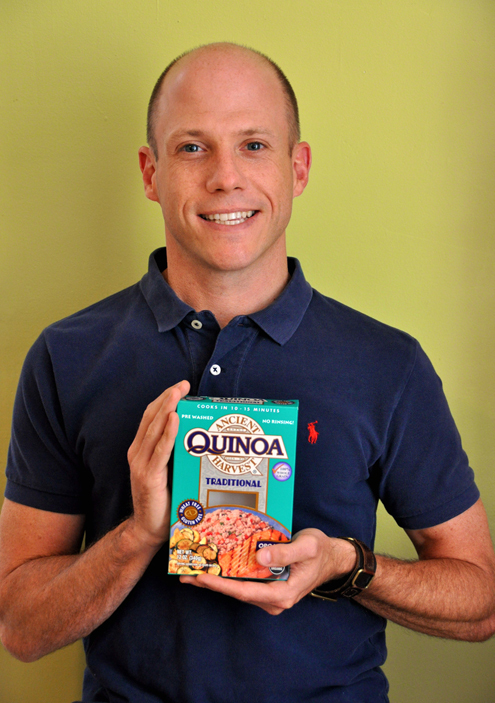 I’m Cuckoo for Quinoa! | Kitchen Mischief! I am obsessed with quinoa. It is an absolute wonder-grain. Yep, I said Wonder Grain. I’m not ashamed — I am a total dork in my love for this stuff! I’ve been cooking with it for years, and Matthew’s a fan — he shared a quinoa salad recipe years ago, and I alluded to its greatness in a post of my own starring avocado bisque. But these paltry posts don’t do my darling quinoa justice. 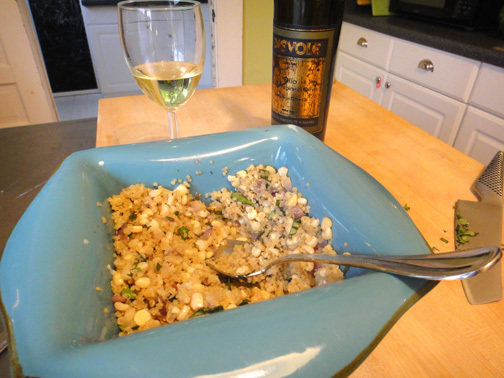 So, just in case you’re not already cuckoo for quinoa, let me tell you why you should join my culinary lovecult. I'm so happy that David was around to photograph. Whenever I use my point-n-shoot, my hands look like "The Curse of the Monkey Paw." Quinoa has a cool name. It’s pronounced KEEN-WA. Not “Quin-Oh-Ah” like I referred to it for years. Keen-Wa! Like you’re about to karate chop a brick in half. Say with me now: “Keen-WA!” Do it! “Keen-WA!” See, it’s fun. It goes with EVERYTHING. You know, sometimes potatoes just don’t go with your meal. Like, who eats potatoes with Asian food? And pasta as a side is just silly. 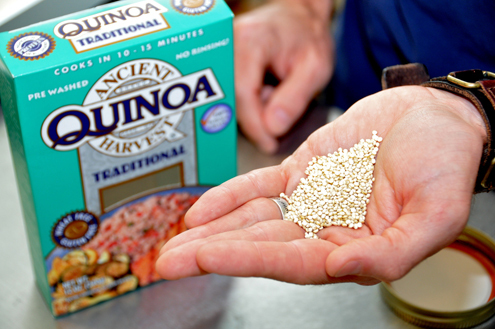 Quinoa is neutral but nutty, a rich flavor that spanks rice in the taste department. Beat, it basmati — quinoa is way tastier! Quinoa’s so easy to cook a four-year-old can do it. Unlike RICE, which I still mess up EVERY SINGLE TIME. And I have a rice cooker! 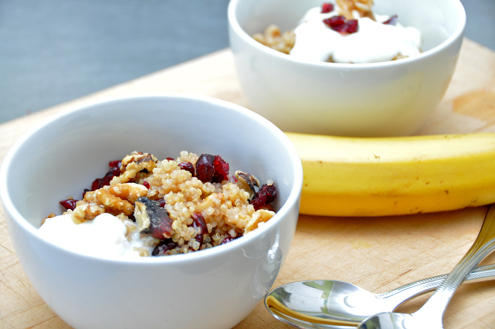 For quinoa, it’s easy — just one part quinoa, two parts water, done! Bring to a boil together, reduce to low, simmer for 15 minutes, DONE. A bundt pan is a corn shucker's best friend! Photo not by David. Combine your quinoa and water in a saucepan (adding salt if not using broth); bring to a boil, then reduce heat to LOW, cover, and cook undisturbed for 15 minutes. Meanwhile, sauté your onions in several teaspoons of olive oil for 5-7 minutes, seasoning to taste. Add garlic and cook for one minute, then add corn and sauté for another 3 or so. Watch it — the corn has more sugar and starts to stick. If you have a little extra basil, toss in about a tablespoon as you sauté, but reserve the bulk of it. Once your quinoa is done, fluff with a fork, then add to the veggie pan. Stir in reserved basil, and you’re done! *Note: I used Penzey’s Shallot Pepper as my primary seasoning. I recommend traveling to Homewood posthaste and picking some up. It may just be the best seasoning ever. I’ll be honest, I’m a bigger fan of it in savory applications, but you gotta love quinoa’s versatility. It’s the little black dress of grains. This entry was posted on July 28, 2011 at 6:18 pm and is filed under Recipe. You can follow any responses to this entry through the RSS 2.0 feed. You can leave a response, or trackback from your own site. 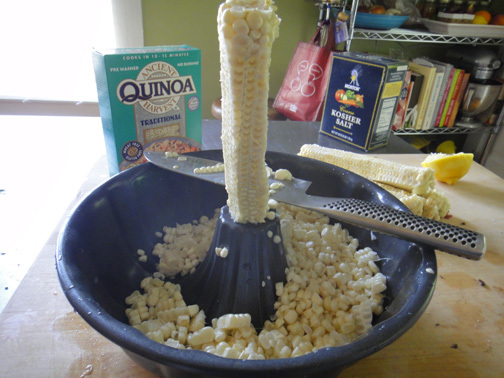 GREAT tip about the bundt pan for the corn!!! Love that! and that recipe looks scrumptious! Gonna try me some quinoa! I’ve known about it but never tried it….why NOT???? Thanks, Suzanne! It’s my favorite side dish right now. I just have to try and not wear it out! Have a great weekend! I just bought Quinoa and didn’t know what to do with it! Thank you for sharing some inspiration! I like the bundt pan idea too! Fun! Good luck, Theda! I hope you have fun with it! Soooo enjoyed reading this. Am def going to try Quinoa…but the Bundt pan idea!!!! Why didnt I think of that? Ingenious!!!!! Thanks for reading, Leigh! The bundt pan is lifesaver. That corn just flies all over my kitchen! Josh, this entry (and the fact that I’ve eaten SO badly this week) reminds me that you’ve threatened to give me a food makeover. And I think you should. I really am a huge couscous lover but I will definitely pick up a box of quinoa at trader joe’s and try your recipe. By the way love the whole karate chop image. Made me literally lol.